Fuel docks up and down the state added 12 cents to gasoline prices. SOUTHERN CALIFORNIA — One of Uncle Sam’s relatives came knocking on every Californian’s door on Nov. 1, informing anyone and everyone who could drive a car, ride a motorcycle, navigate a boat or otherwise operate any fuel-consuming vessel they would be paying more at the pump. Gasoline prices have certainly jumped in the days and weeks since, thanks to the passage of Senate Bill 1 (SB 1) earlier this year. SB 1, in case you forgot or need a refresher, called for a 12-cent increase in gasoline taxes. The 12-cent hike was passed on to vehicle drivers, motorcycle drivers and boat owners alike, officially kicking in Nov. 1 (roughly six months after it was approved by legislators and signed into law by Gov. Jerry Brown). Policymakers pushed SB 1 forward as a means to raise funds for various infrastructure projects. California’s roads, highways and bridges needed to be improved, according to those who backed SB 1. Enacting a 12-cent gasoline tax, Brown and legislators explained, would be the only way to save the state’s infrastructure from falling apart. Suffering through a gasoline tax now would actually be less painful than the cost of paying for failed infrastructure somewhere down the road, supporters of SB 1 argued. Not everyone has drunk the Kool-Aid yet, naturally. The gasoline tax also spawned efforts to recall at least one member – Josh Newman, D-Fullerton – of the California State Senate. Meanwhile a Republican legislator in Sacramento authored an initiative for the 2018 ballot to have the gasoline tax repealed. As the political process plays out, however, California’s boaters, drivers and motorcyclists, among other vessel operators, will be paying more at the pump. The Log’s previous coverage of SB 1 confirmed the gasoline tax definitely hits boaters and fuel-based watercraft users no different than terrestrial vessel operators. One boating advocate stated he wouldn’t be using his boat as much once the gasoline tax went into effect. Fuel data gathered by one website in particular would support such a disincentive to navigate one’s vessel in local waters. GasBuddy.com, a website tracking fuel prices nationwide, had California ranked as the state with the most expensive gasoline. The average prices of fuel in California, according to the website, was 3.233 per gallon, about 9 cents higher than the consumer cost of gasoline in Hawai’i, which ranked second highest. The American Automobile Association’s (AAA) study of gasoline prices in California found the current cost of filling up was $3.230 per gallon (as of Nov. 8), up from $3.112 per gallon one week earlier. Filling up in California cost $2.791 per gallon, on average, at this same time last year, meaning boaters, drivers, motorcyclists and others are paying almost 44 cents per gallon more today than in November 2016 for gasoline. The cost of diesel has also increased significantly, according to AAA. One gallon of diesel costs $3.497 per gallon, according to AAA’s data on Nov. 8, up from $3.477 the previous day and $3.266 on Nov. 1. Diesel was available for $3.166 per gallon, on average, in early October, according to AAA; the tax increase on diesel use, however, did not apply to off-road vehicles. What about gasoline prices at fuel docks? A quick sampling of Southern California fuel docks in Dana Point, Newport Beach and San Diego revealed a range of prices. Gasoline prices at the fuel dock at Hill’s Boat Service in Newport Beach were $3.41 (regular) and $3.73 (supreme), as of Nov. 8; both prices included taxes. Hill’s Boat Service added the 12-cent gasoline tax hike the day it went into an effect. High Seas Fuel Dock in San Diego offers 91 Octane at $4.22 per gallon (also factoring in 12-cent gasoline tax hike) one week into the tax hike. Boaters at Dana Point Fuel Dock, meanwhile, were filling up for $3.93 per gallon for regular and $4.18 per gallon for supreme (also as of Nov. 8); both prices factored in the 12-cent gasoline tax hike. The post-tax hike price for gasoline at the fuel dock in Santa Barbara was $3.31 per gallon (cash) on Nov. 8 ($3.41 per gallon for credit card users). The gasoline tax, of course, will hit boaters who don’t fill up at fuel docks, as there are thousands of people in California who keep their vessels on a trailer. 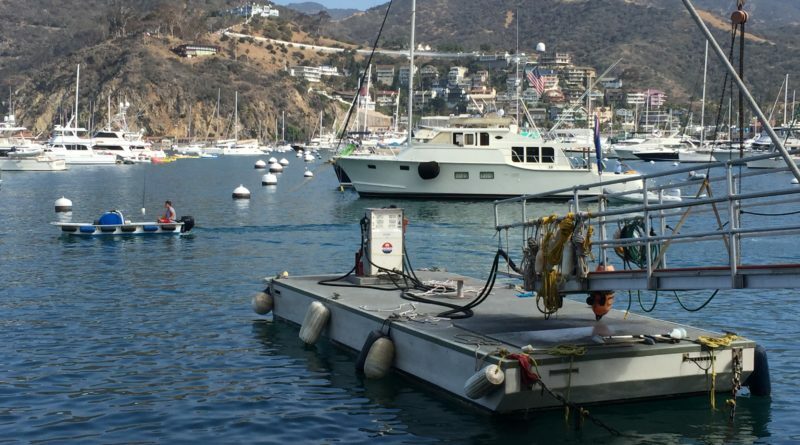 “It has already affected business and many boaters are indicating that it will effect their boat usage,” David Beek of Island Marine Fuel in Newport Beach told The Log. “It coincides with a major increase in the ‘barrel’ price, which also increases the price per gallon, so it is a double hit! California’s 12-cent tax hike on gasoline certainly makes it a little more expensive to enjoy boating. The question, looking forward, is whether efforts to undo the levy would be successful. What, “it will effect their boat usage”, “We really need to get the tax repealed” if you can’t afford 12¢ a gallon, you really shouldn’t own a boat. Boating should be for everyone especially families, which many have a hard time making ends meet. Raising tax on gas is the politicians answer for miss spending their budget. Since November 1 2017 Californians now pay 41.7 cents per gallon. The folks that say if you cant afford the 12 cents you shouldn’t have a boat need to get off the Cool-aid and smell the coffee. Eliminating lower income folks from boating or limiting their boating time with their families is terrible. There should be a petition to get rid of the Governor. This is bad leadership.